The Muller family has been a joy to work with and know over the years and Debby’s wedding was going to be a special treat for us, as we photographed her sister’s wedding at The Homestead almost five years ago to the day. This wonderful afternoon made for many special moments and it was quite hard for me to choose just one moment for our blog. The St. Regis is one of the worlds most exceptional hotels. Their elegance and service is as good as it gets and I was excited to document a wedding in this grand facility. Debby’s suite was stunning and gave us lots of space….for a photographer that appreciates getting close and using wide lenses to allow for many layers, the size of the room was wonderful news. When a father enters the room for the first time, it is one of those time periods that you have to not only be ready, but you must be aware of your surroundings. 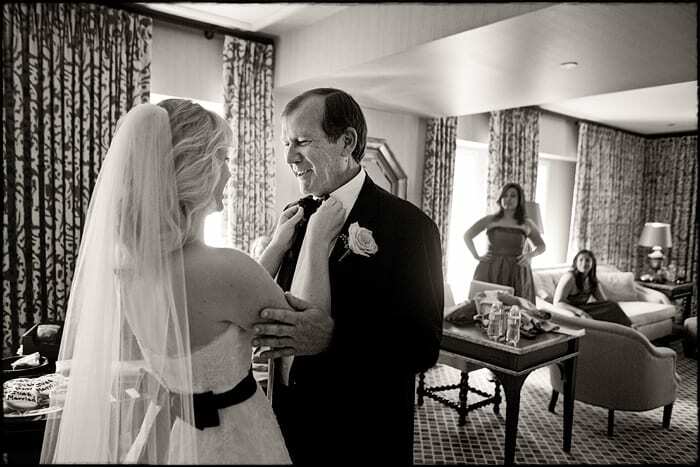 The father’s face, looking at his daughter, is undoubtedly the most storytelling piece of the image. However, the bridesmaids in the background really make the image work for me. Going beyond capturing the moment allows us to show the important elements of a scene along with the emotion. To me, it’s very important to show what else is happening beyond the obvious……but at the same time, I must keep distracting elements to a minimum. It’s why I often print in black and white. It allows us to lighten and darken more effectively and in my opinion, shows the true essence of printing. This photograph was captured in color, converted to black and white, and a subtle sepia tone was applied to add to the warm feeling. I love the moment, the adjustment of the tie, the touch of the hand, the face of both Debby and her father, and the elements of the background. It shows the feeling, the room, and the small audience of bridesmaids.